2008 Hugues Godme Les Romaines 1er Cru - $69.99: Vins Rare, The finest selection of rare wines. "Godmé's 2008 Les Romaines 1er Cru offers notable depth and textural resonance. The Romaines seems to have enough depth of its own to give the wine body and richness, even with no dosage. 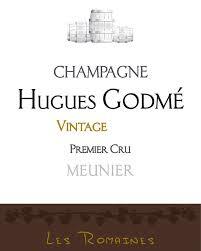 This brilliant, poised Champagne gives the impression it will drink best sooner rather than later. Disgorged in July 2017 with no dosage."